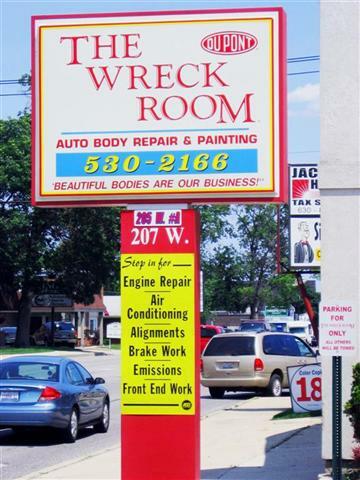 The Wreck Room Auto Body Repair and Painting in Villa Park, Illinois provides 5 Star Service and offers assistance in claims with insurance companies from scratches to major collision damage. Our large waiting room (with WIFI) accommodates our customers comfortably while waiting for their complete and detailed estimates. Our Frame, Body, and Paint experts are constantly attending classes and seminars to keep up with the ever changing auto repair industry. Beyond school training, trade association training, and years of experience, our team goes a step further by receiving specific manufacturer training available from many auto brands. Using State of the Art Equiptment and Quality Paint All work performed at The Wreck Room is 100% guaranteed. The Wreck Room was voted best name in the business by "Body Shop Magazine "
The Wreck Room welcomes commercial accounts and all insurance company programs. So whether you are coming from Elmhurst, Lombard, Oak Brook, Addison, or Villa Park itself, we are worth the drive.